OF REDISCOVERED EARLY 1900s BROADWAY SCORES! Performed by the Paragon Ragtime Orchestra, Rick Benjamin conductor; featuring Colin Pritchard’s recreations of Cohan’s singing style, comedienne Bernadette Boerckel, and the Yankee Doodle Singers. “Geo. 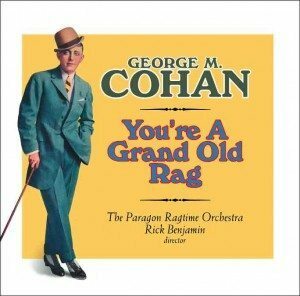 M. Cohan’s Rag” (from the Cohan & Harris Minstrels of 1909). “Give My Regards to Broadway” (song from Little Johnny Jones, 1904). “Popularity” (overture to the Cohan dramatic play Popularity, 1906). “The Yankee Doodle Boy” (song from Little Johnny Jones, 1904). “That Haunting Melody” (song, 1916). Overture to Little Nellie Kelly (1922). “There’s Only One Little Girl For Me” (one step, 1916). “Grand Selection from The Man Who Owns Broadway” (1909). “Harrigan” (song from Fifty Miles from Boston, 1908). Overture to The Talk of New York (1907). “Mary” (song from Forty-Five Minutes from Broadway, 1906). “Ethel Levey’s Virginia Song” and “You’re a Grand Old Rag” (1906). “The Eyes of Youth” (song from The Cohan Review of 1918). Appendix: George M. Cohan giving an after-dinner speech (recorded 1938). Read the full review here: allmusic guide review. More than a century after he rocketed to fame, George M. Cohan’s name still conjures up vivid images of the archetypical Broadway song-and-dance man. But Cohan (1878-1942) was far too important and complex an artist to sum up so breezily. He was one of the most brilliant figures in theater history, celebrated as an actor, dancer, choreographer, playwright, lyricist, composer, director, producer, and theater owner. His range of talent was itself remarkable. But astonishingly, Cohan often fulfilled all these roles simultaneously, and with breathtaking skill. Historians have long viewed George M. Cohan as one of the most important figures in the evolution of the American theater. Yet his successes as a performer have overshadowed his equally impressive influence as the creator of some of this country’s greatest pop music; Cohan’s raggy tunes and slangy lyrics injected a new sense of vitality, brashness, and informality to the American stage, creating a stylistic template adopted (and amplified) by later Golden Age figures such as Jerome Kern and George Gershwin. This new CD for New World Records presents a fresh and compelling look at Cohan’s music using original period orchestrations (none of which have ever been recorded before), played with authentic style on antique instruments by the Paragon Ragtime Orchestra. Here for the first time, modern listeners have the opportunity to enjoy George M. Cohan’s music exactly as it was originally heard in grand theaters of the early 1900s. This CD includes a forty page booklet packed with historic photos, as well as newly-surfaced recollections of the “Yankee Doodle Boy” from Cohan’s co-stars, employees, and show-biz associates.